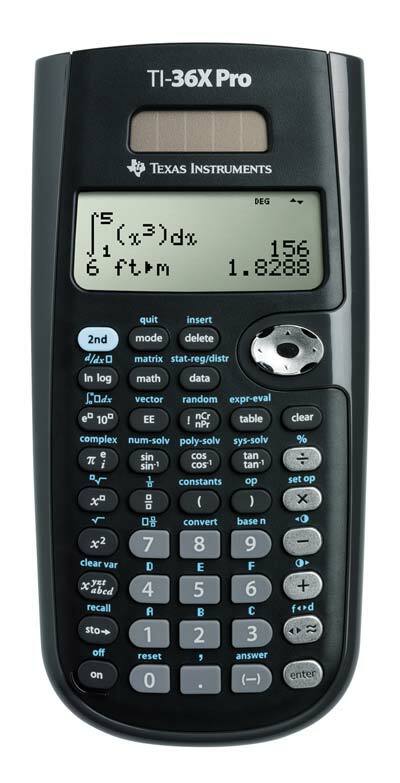 The amazing TI-36X Pro is now available for sale on Amazon Click here to see Amazon’s best price on this great calculator . A couple of months ago, I was flipping through a math teacher supply catalogue, looking at the pictures of the new TI-Nspire CX and Casio Prizm, when something caught my eye. It was an add for a scientific calculator that I had never seen. “TI-36X Pro Scientifc Calculator with calculus, available soon,” read the headline. This little calculator has gotten almost zero hype in the wake of the color graphing calculator battle going on. When I asked a Texas Instruments sales rep about it at the TI booth at NCTM in Indianapolis he seemed mystified and actually told me, “You’re in the wrong place.” I had to show it to him on TI’s website to convince him it was a real Texas Instruments calculator. Despite the lack of attention it was getting, I was extremely intrigued. I eventually reached out to one of my contacts at Texas Instruments headquarters to inquire about getting to take a look at one for a TI-36X Pro review and was immediately was sent one. In short, the TI-36X Pro (not to be confused with the standard TI-36X) offers many of the features of a graphing calculator on a scientific calculator. I consider it a lifesaver for high school and college students that for some reason are not allowed to use a graphing calculator. Whether you’re using the PLYSMLT2 app on a TI-84 or the algebra submenu on the TI-Nspire, you’re used to having the ability to solve polynomial equations and systems of linear equations on your calculator. The TI-36X Pro now brings this ability to a scientific calculator. In addition to polynomial equations and systems of linear equations, there’s also an equation solver that will solve most other equations for x, just like the solver that’s been available for years on Texas Instrument’s non-graphing calculators like the TI-84. There’s a surprising amount of power here. You can use the 36X Pro to solve definite integrals and derivatives for calculus. It’s also easy to perform a variety of operations on the screen. The matrices are edited in a separate window and operations are performed with names A, B, C, etc., much like the TI-84 worked before OS 2.53. Other features unique among TI scientific calculators include complex numbers and even vectors. As I worked my way through the features on the 36X Pro, I kept thinking, “It’s just so easy to use.” Much like the TI-30X Multiview, you’ll find that the 36X Pro simplifies radicals, finds exact trig values, simplifies expressions involving pi and more. I also really like how the button interface works. While there is a “2nd” button like you’d find on virtually any scientific or calculator button, there are just way too many functions for a 2nd button only. I have seen some calculators with a “3rd” button. Fortunately, Texas Instruments went a different direction. Some buttons have more than one function actually printed on the button itself. A good example is sin and sin-1. By pressing that button multiple times, you’ll see the additional functions appear on the display, each time the previous replaced by the next, until you stop on the desired function. OK, I don’t want you to have the idea you can do everything on this calculator that you could do on a graphing calculator (besides graph, of course). First, this isn’t a CAS, so don’t expect anything solved in terms of a variable. That means calculus functions are solved for exact values only (no indefinite integrals). Additionally, the equations dimensions are limited. You can’t solve for the zeros of a polynomial function larger than degree three or a system of linear equations with more than three variables. While I wish the limitation was at least four, it’s still a pretty great feature given the price, and it still covers over 95% of the equations I run into in a given school year. The TI-36X Pro is an incredibly powerful scientific calculator in an easy to use interface. For younger students (middle school and early high school), I’d still recommend the TI-30X Multiview as their scientific calculator. That’s still going to be easier for a young student to use. However, as students move into late high school and college, they’ll want more power than the Multiview can deliver. With both calculators coming in at $20 or less, I’d recommend buying the Multiview for a seventh grader and replacing it a few years later with a 36X Pro. Honestly, this calculator will give students a significant advantage over their counterparts using a traditional scientific calculator, and I highly recommend it as the backup to a graphing calculator for late high school and college students, or as a primary calculator if you’ve got a teacher/professor who doesn’t allow graphing calculators. Click here to see the TI-36X Pro Price on Amazon.